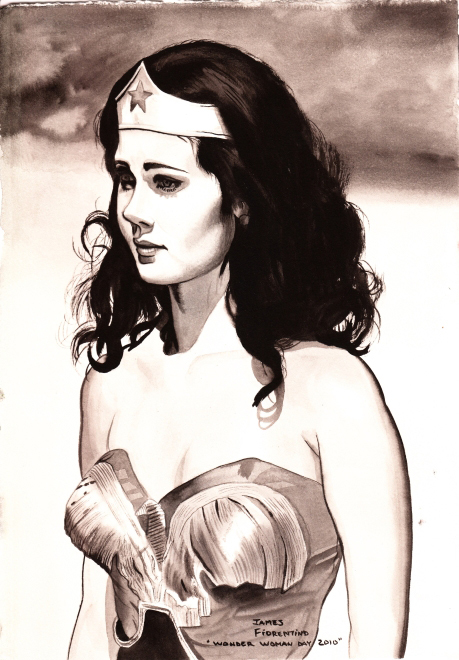 Right now in the US today is still yesterday, which means it's still Wonder Woman Day - an amazing annual auction of donated Wonder Woman art, to raise money for domestic violence programs. This it's 5th year! As a former counsellor myself, I can attest to how often people use icons in dark times to pull them through - heck even one person I handled used Homer Simpson. While the avenging amazon is often used more in the context 'I can't do it, I'm not Wonder Woman' this event is an awe-inspiring show of positive force, using comics' most global heroine to fundraise the money to support those that respond 'Yes you are, you just don't realise it yet'. From Alex Ross to Chris Giarrusso, hundreds of artists are taking part. The stunner above was done by sports artist James Fiorentino. If you are in Portland Oregon, or Fleming N.J do check it out in person if there's still time, or if you'd just like to stun yourself with the range of art and talent generously donated to this years event, you can find both online galleries and auctions all after the jump at the Wonder Woman Museum. Sometimes people forget why superheroes are important, and it's things like this that remind us. I like seeing heroes as role models who can help someone through a hard time. And that's a lovely picture, too! For me, personally, I found old episodes of MST3K to be very therapeutic! Thanks for the comments Liss - good comedy is hard to beat isn't it! That's why the person I referenced used Homer Simpson - it was their guaranteed smile. Of course the TV was in a room shared by one of their antagonists but there's always a way around it! I think that importance is what puts Wonder Woman in the trinity over the bigger sellers like GL and Flash - is what she represents. She's just such a tangible motivator and icon off the comic book page in so many ways any close contenders will spend years catching up. No worries Amber - it's a great event to be able to talk about and is really for a worth while cause. You all do a great job! If there were only more like it! Thanks for stopping by IADW - will definitely be posting again on what you guys get up too, no doubt with even bigger results in 2011!